Visible to the naked eye, Jupiter looks like a very bright star. Much of our current knowledge about the planet was gathered by a series of US space probes. 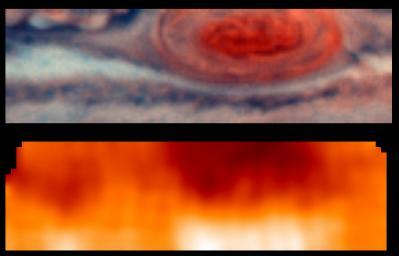 The first close-up measurements of Jupiter's environment were made in 1973 and 1974 by Pioneer 10 and 11, which also took some superb images at a distance of 42,000 km from its atmosphere. In 1979, two separate flybys by Voyager 1 and 2 extended our knowledge of the planet. Launched in 1990, the Ulysses probe to explore the Sun used a Jupiter swingby to modify its trajectory and propel it towards our star. At the same time, it provided valuable data on Jupiter’s surrounding magnetosphere and radiation belt which were later supplemented by the Cassini probe’s observations. These data have given us a better understanding of how our own magnetosphere protects us from solar radiation. Following its launch in 1989, Galileo became the first spacecraft to orbit a gas giant. A probe was sent into Jupiter’s atmosphere, where it spent 59 minutes measuring temperature, pressure, chemical composition, cloud properties, sunlight, internal energy sources and lightning flashes, before being destroyed by the high pressure and intense heat. The Galileo orbiter went on to conduct studies of Jupiter’s atmosphere, satellites and magnetosphere. 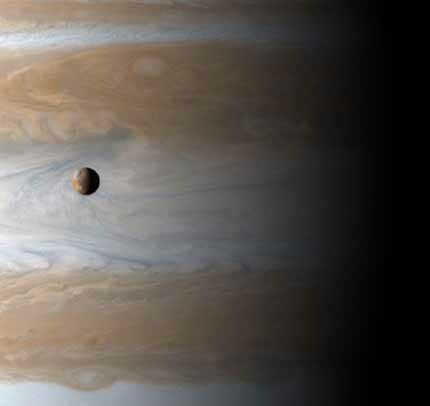 Scheduled for 2011, the Jupiter Icy Moons Orbiter mission will conduct a more in-depth study of satellites Callisto, Ganymede and Europa, and their potential to harbour life. …you’d experience temperature variations greater than any on Earth, as you moved around in the atmosphere.